Today, we're participating in the Luck of the Irish Blog O'Thon with a feature on two of old Hollywood's legendary Irish Americans, James Cagney and Pat O'Brien. Here's Cagney (front row, left) and O'Brien (front row, right) at the races with their fellow "Irish mafia" members Frank McHugh (back row, left) and Spencer Tracy (back row, right). Based on their expressions, I would say O'Brien's horse finished in the money. James Cagney and Pat O'Brien are one of the legendary duos in old Hollywood films. The lifelong friends starred in nine films together. Some of the films were classics like Angels with Dirty Faces (1938), while others were mediocre, but Cagney and O'Brien's great chemistry and mutual admiration always came through onscreen. Rocky Sullivan (James Cagney) pulls a gun on his old pal, Father Jerry Conolly (Pat O'Brien), in Angels with Dirty Faces (1938). The pair were so well-suited partly because their onscreen personas were so different. Cagney, surely one of the greatest of American actors, was mercurial and passionate, playing a series of gangsters, dancers and airmen with unmatched charisma and energy. On the other hand, O'Brien was mild mannered and avuncular, best known for playing Catholic priests or saintly father figures like Notre Dame football coach Knute Rockne. 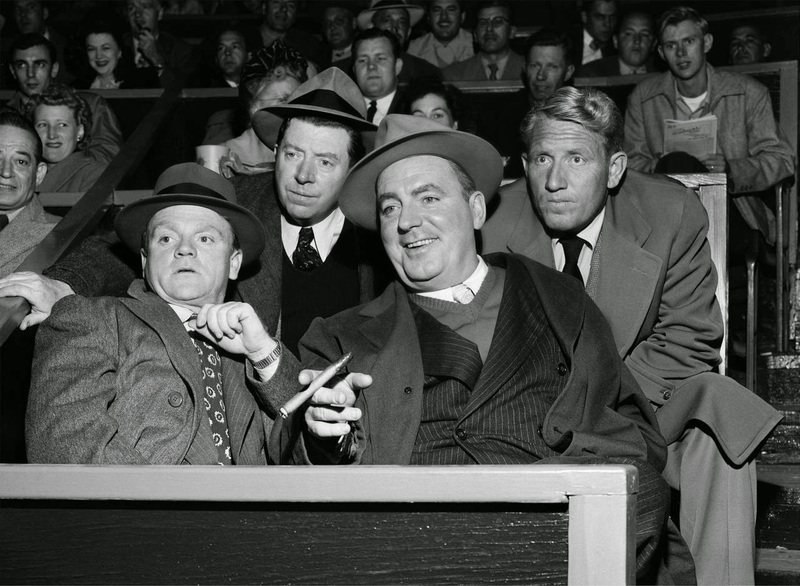 Cagney's bad-boy image made O'Brien look cool, while O'Brien's amused tolerance for some of his co-stars over-the-top antics helped Cagney earn the approval of moral guardians like the Catholic Legion of Decency. Oddly enough, it seems that the two men were far different in real life: Cagney was an introvert and a homebody, while O'Brien was a skilled raconteur, who was the life and soul of every party. 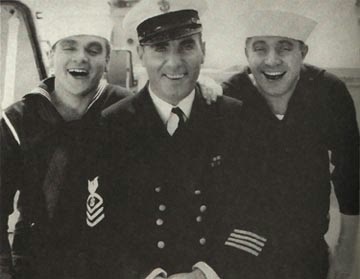 James Cagney, Pat O'Brien and Frank McHugh on the set of Here Comes the Navy (1934). Of course, both O'Brien and Cagney were Irish Americans, but they came from very different backgrounds. Cagney, grew up in the slums of New York's Lower East Side, the second of seven children born to an impoverished family. Cagney learned toughness and resilience early in life, becoming an accomplished street fighter so he could make his way through New York's mean streets. Cagney's domineering mother wanted him to become a doctor, but Cagney's family badly needed money, so he dropped out of school to become a dancer. Cagney knocked around vaudeville, Broadway and movies for years, before he got his big break in The Public Enemy (1931). Cagney was originally slated to play a supporting role in the film, but director William Wellman recognized his star power and cast him in the lead role, as a young man who turns to bootlegging and becomes a high-powered gangster. 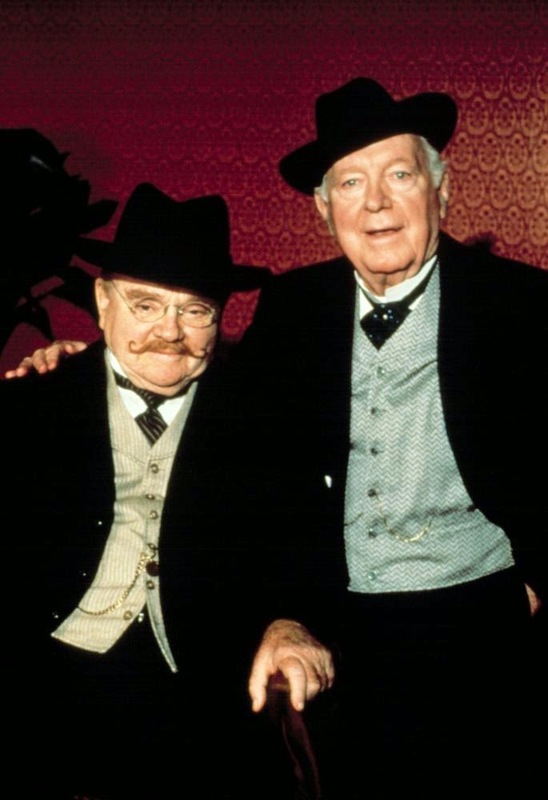 The two old pals on the set of their last film, Ragtime (1981). O'Brien grew up in solidly middle class Irish Catholic family in Milwaukee. He and his lifelong friend, Spencer Tracy, attended the prestigious private school, the Marquette Academy, before serving in the Navy during World War I. After the war, Tracy and O'Brien both pursued acting careers, first in New York and then in Hollywood. 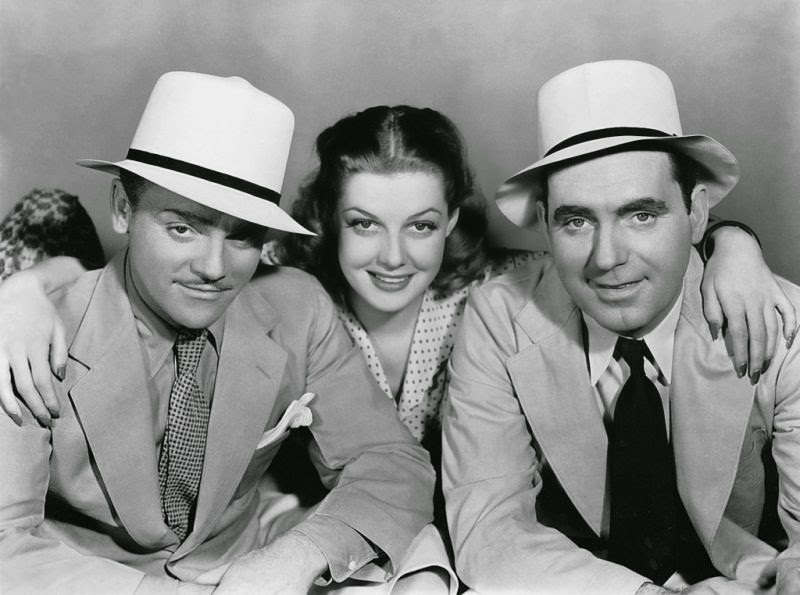 James Cagney, Ann Sheridan and Pat O'Brien in Torrid Zone (1940). O'Brien signed a contract with Warner Brothers in 1933. The studio promptly placed O'Brien in films with his old pal, Cagney (the duo first met in 1926). Cagney and O'Brien's first onscreen pairing was in Here Comes The Navy (1934), a huge hit that was nominated for Best Picture. The dynamic duo reeled off a string of box-office bonanzas throughout the thirties and early forties, including Devil Dogs of the Air (1935), Ceiling Zero (1936) and Torrid Zone (1940). Their onscreen partnership largely ended after 1941 when O'Brien left Warner Brothers after a contract dispute, although they remained close friends throughout their lives (Cagney always referred to O'Brien as his "dearest friend"). Director Milos Forman reunited the two old troupers in 1981 for his historical epic, Ragtime. Here are Cagney and O'Brien talking about their friendship and films in a BBC interview. Here's a brief rundown of three of Cagney and O'Brien's best films and where you can view one or all of them for your own St. Paddy's Day marathon. Cagney and O'Brien play brothers who are battling for the affections of Olivia de Havilland. This one can be hard to find, but it's a great deal of fun. DVD. Cagney and O'Brien play boyhood friends who take very different paths in life thanks to a cruel twist of fate. 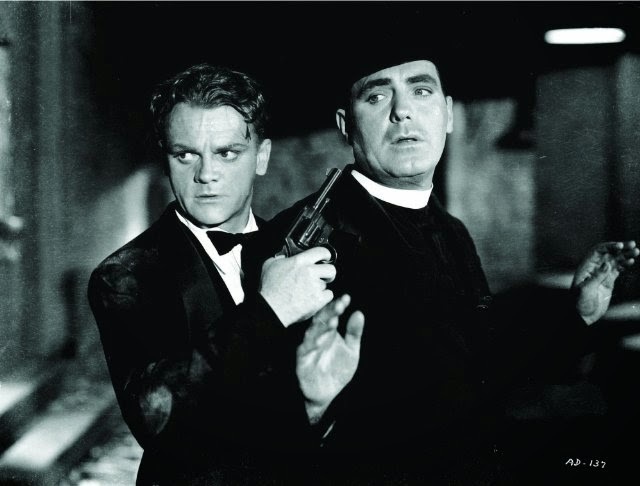 Cagney becomes a ruthless gangster, while O'Brien becomes an incorruptible priest. Angels with Dirty Faces is one of the greatest gangster films, and Cagney gives perhaps his best performance, especially in the well-known execution scene. DVD and video on demand. This World War I drama is basically Angels with Dirty Faces in the trenches, with Cagney as a smart-mouthed, cowardly private and O'Brien as yet another saintly padre on a mission from God. The Fighting 69th contains my very favorite Cagney and O'Brien scene (clip below). The more insouciant Cagney becomes ("Hiya, St. Francis, how's all the monks? "), the more O'Brien puts on his attitude of saintly suffering. DVD and video on demand. The affection between the two is so genuine that it makes us all feel a part of something special when we enjoy Jimmy and Pat together in a film. "The Irish in Us" came on TCM this morning. I recorded it to my dvr. Can't wait to watch it! I was just now looking through the rest of your blog and discovered that I started mine just one month before you did! You have over twice as many posts though... I'm really just starting to get into the swing of things. I really like your "Life in Film" posts. After writing about the passing of Bacall and James Garner on my other blog I decided I needed a blog just for movies. I'm glad you liked the Life in Film posts. Those are always the most difficult for me to write for some reason. I finally got around to watching "The Irish in Us." I also watched "Here Comes the Navy." Loved both of them!!!!! The end of the Navy one was hilarious. I love Cagney's comedies. Shucks, we can't find The Irish in Us anywhere! Just saw The Fighting 69th a few weeks ago and really enjoyed it. I never knew that Tracy and O'Brien were friends prior to Hollywood. This was a great read! Thanks for contributing this post for the blog o'thon. By the way, I noticed that in your About Me, you're from Northeast Ohio. We're from North Olmsted! Thank you for including me in the blogathon. It was a real treat. It's great to meet fellow Northeast Ohio classic movie fans. I live in Garrettsville. It's really a small world. Nice write-up. I have to admit, I'm not terribly fond of "The Fighting 69th", though; it's too rah-rah for my taste. Aside from "Angels with Dirty Faces", the Cagney/O'Brien films i'm most partial to are "Ceiling Zero" and "Here Comes the Navy", which I just saw for the first time recently, and liked a lot ("Torrid Zone" I would rank just below). I haven't seen "The Irish in Us", though based on what I caught on TCM when it aired, and from what you wrote about it, I'm willing to give it a shot. The Fighting 69th is one of those pre-World War II propaganda movies that were designed to get the American public ready for War.There were a lot of them in the early forties focused on World War I like Sgt. York, Random Harvest, even Yankee Doodle Dandy. I like The Fighting 69th because Cagney's so great in it, but then again he was great in everything. Great article, Amanda! Cagney is my favorite actor, and I saw how much he loved O'Brien by the affection he showed for the friend in his autobiography, Cagney by Cagney. Also, wonderful picture of th "Irish Mafia"
Hola, Amanda, In doing some research and editing of incorrect information on a few other webs (wiki+, IDM+) I came across your blog. The respect and caring you have for this particular era, especially for Dad and Jim, really come through. I look forward to keeping in touch. Blessings. Mavourneen O'Brien, Pat's eldest daughter, 81, residing in Baja CA, Mexico. Hola, Amanda. In doing some extra research and editing of incorrect info on a few webs (wiki+, IDMB+) I came across your blog. The respect and caring, especially of Dad and Jim, are very evident. Hoping to keep in touch. Blessings. Mavourneen O'Brien, Pat's eldest daughter, 81, residing in Baja CA, Mexico. Thank you so much for your kind words. I'm truly honored that you enjoyed my article on your father and James Cagney and enjoyed my website. They were both great actors and wonderful men and I hope my articles encourage young people to watch and appreciate their work. You can contact me anytime via e-mail at agarrettsun@yahoo.com.